This is node.js module for executing os commands against a pool of stateful child processes such as bash or powershell via stdout and stderr streams. 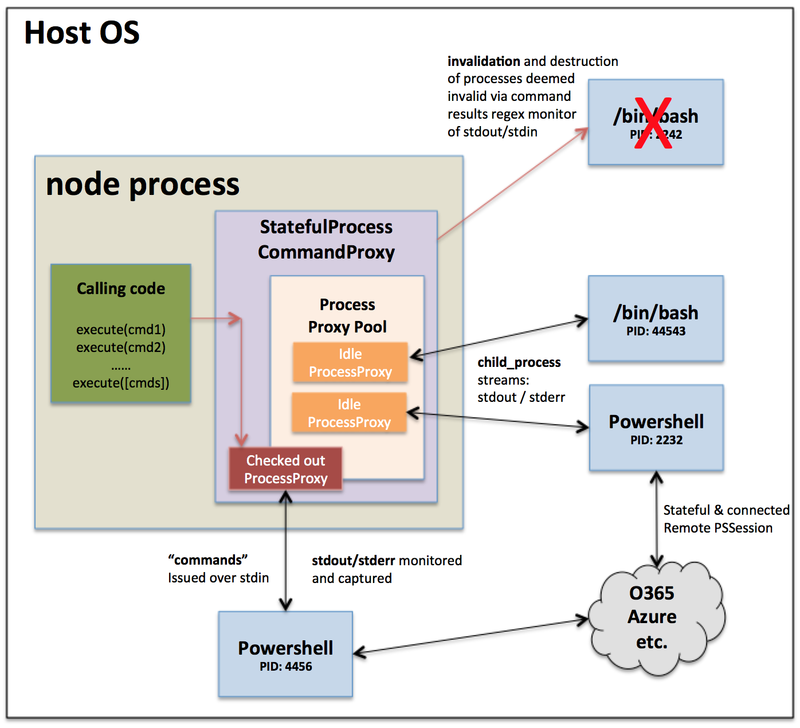 It is important to note, that despite the use-case described below for this project’s origination, this node module can be used for proxying long-lived bash process (or any shell really) in addition to powershell etc. It works and has been tested on both *nix, osx and windows hosts running the latest version of node. If you have done any work with Powershell and o365, then you know that there is considerable overhead in both establishing a remote session and importing and downloading various needed cmdlets. This is an expensive operation and there is a lot of value in being able to keep this remote session open for longer periods of time rather than repeating this entire process for every single command that needs to be executed and then tearing everything down. Obviously this module can expose you to some insecure situations depending on how you use it… you are providing a gateway to an external process via Node on your host os! (likely a shell in most use-cases). Here are some tips; ultimately its your responsibility to secure your system. Never expose calls to this module directly, instead you should write a wrapper layer around StatefulProcessCommandProxy that protects, analyzes and sanitizes external input that can materialize in a command statement. Ideally yes, I think your remote ps-session idle time should be larger than your expected idle exec time between commands; if you don’t want the pool to re-establish a new process every time you invoke your command. However if the connection dies/is cut between your execution cycles, it will create a new process anyways. If you have any further comments, issues, requests etc please add them on the respective projects on github! Thanks and hope it will be useful for you.